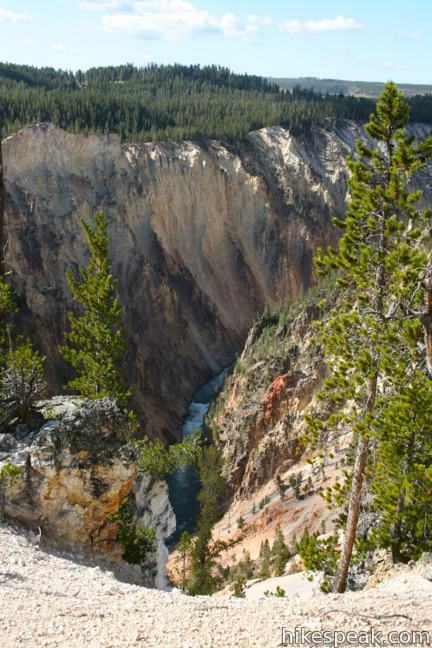 No trip to Yellowstone National Park is complete without a visit to the Grand Canyon of the Yellowstone River, a deep chasm with two fetching waterfalls. 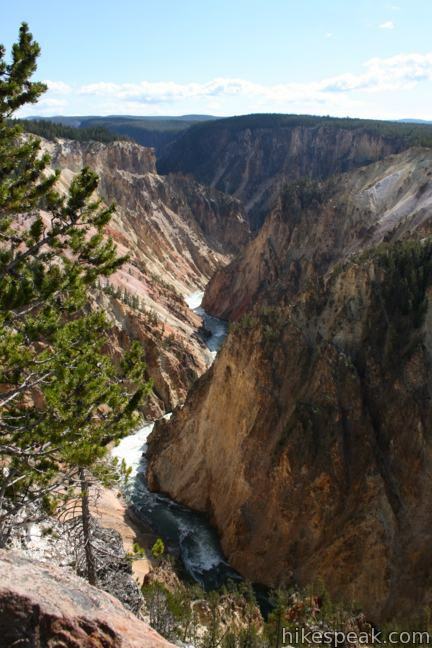 You can get numerous memorable views of the canyon by hiking along North Rim Trail, which stretches 3.8 miles over a paved and unpaved path crossing the northwest wall of the Grand Canyon of the Yellowstone River (with just 250 feet of elevation change). Some sections of North Rim Trail parallel North Rim Drive, a road that allows visitors to drive right up to some of the north rim’s exceptional overlooks. The road makes it easy to hike North Rim Trail in segments, or avoid retracing your steps with a through hike utilizing a second vehicle. 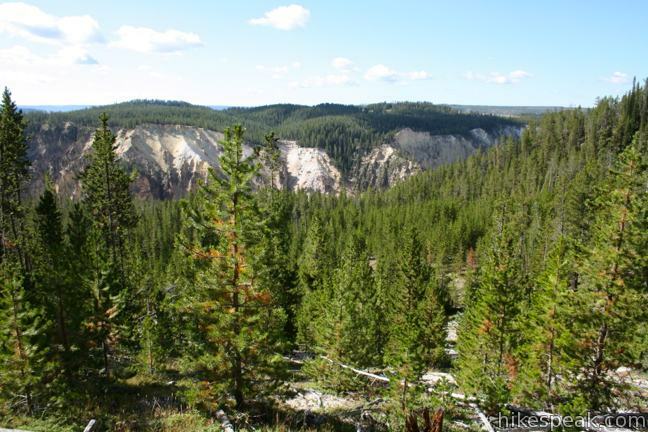 Away from the road, North Rim Trail crosses pristine pine forests perched atop precarious canyon walls. 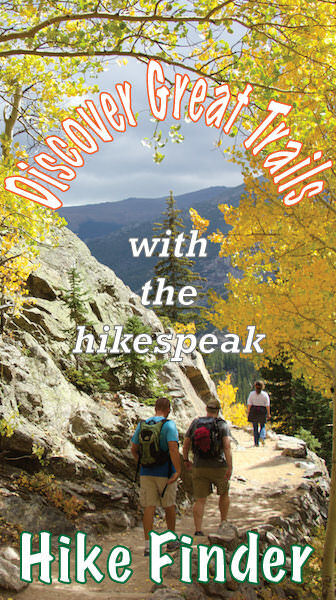 The trail connects several named and noteworthy viewpoints while passing unnamed views that will stop you in your tracks. 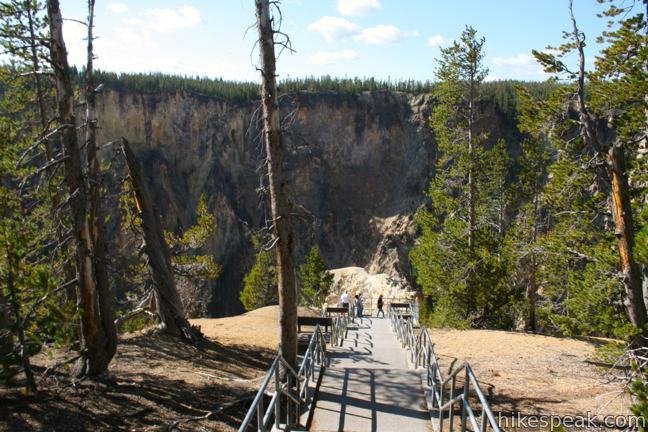 At it’s northeast end, North Rim Trail gets off to a stirring start at Inspiration Point, and then runs southwest past the Upper Falls of Yellowstone Falls, reaching a bridge that crosses the Yellowstone River for the south rim. 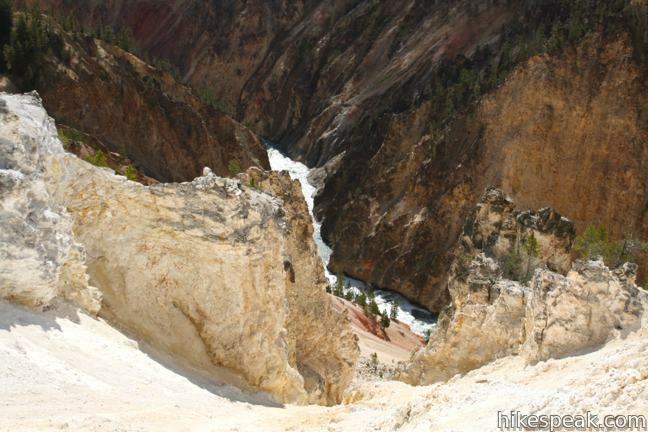 Persistent hikers can continue up South Rim Trail for the opposing view of the Grand Canyon of the Yellowstone. 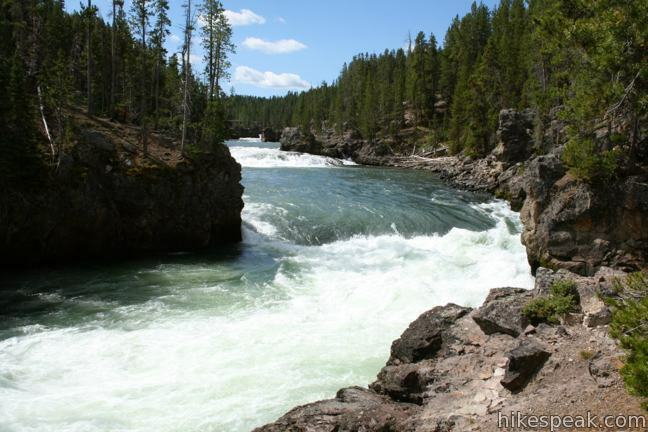 Hikers with less time can exclude the final southwestern leg of North Rim Trail, which follows a calmer section of the Yellowstone River upstream from the canyon, and reduce the hike to the 3.3 miles between Inspiration Point and Upper Falls. North Rim Trail makes a great through hike for those with two vehicles, or a 6.6 to 7.6-mile round trip hike with deep impressive views. 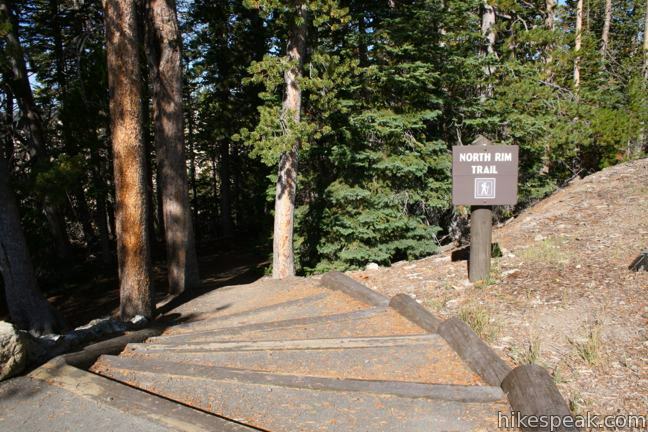 Starting from the top of the stairs leading to the panoramic views at Inspiration Point, North Rim Trail parts with the road and crosses a forest of lodgepole pines. The forest is quiet, and surprisingly peaceful considering how close it is to a dangerous canyon wall. 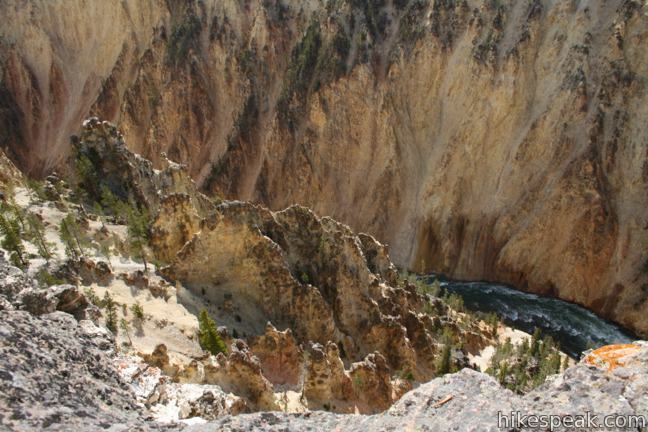 After curving through the forest, the trail passes directly along the edge of the canyon, where just a few feet separate the dirt path from a sheer thousand-foot drop to the Yellowstone River. 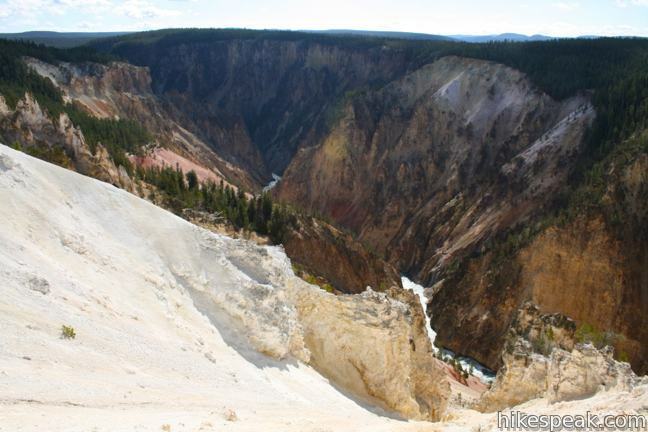 The views are beautiful and daunting—an acute V-shaped canyon with bright orange, yellow, and pink walls surrounding a river of swift dark blue water capped by white rapids. It is a mere 3/4 of a mile across the chasm to the south rim. 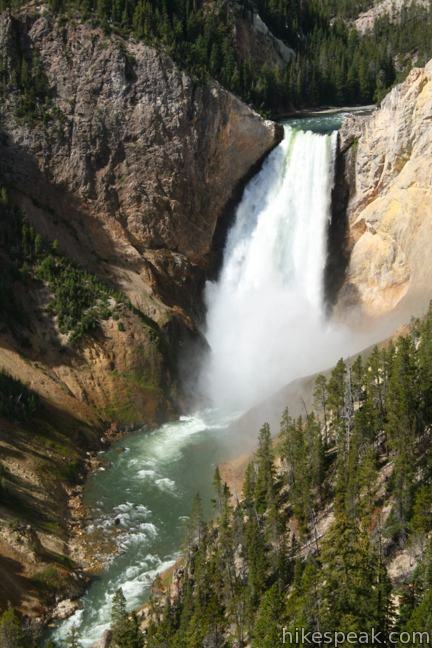 Starting at the Upper Falls of Yellowstone Falls, the Yellowstone River carves a deep 20-mile gash across the pine-covered landscape, and the North Rim Trail delivers exceptional views of the most stunning section of the canyon. After 1 1/3 miles you will hit pavement and arrive at Grand View Point, the next named lookout along the trail. 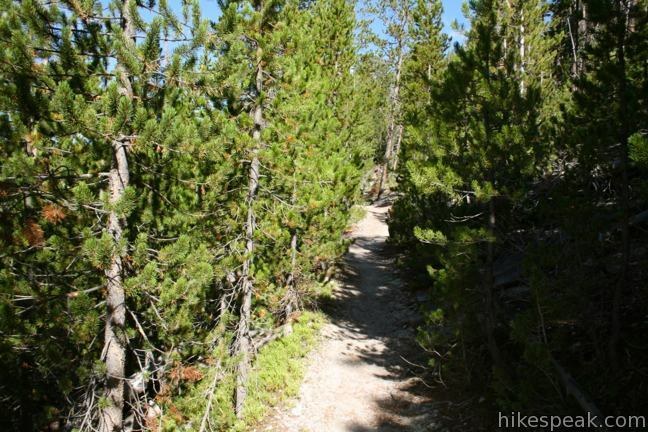 North Rim Drive parallels the trail as you continue to hike past Osprey Point to a superb spur trail to Lookout Point and Red Rock Point (1.7 miles from the start of North Rim Trail at Inspiration Point). The view from Lookout Point should not be missed, so turn left on a 0.15-mile round trip spur to the overlook. 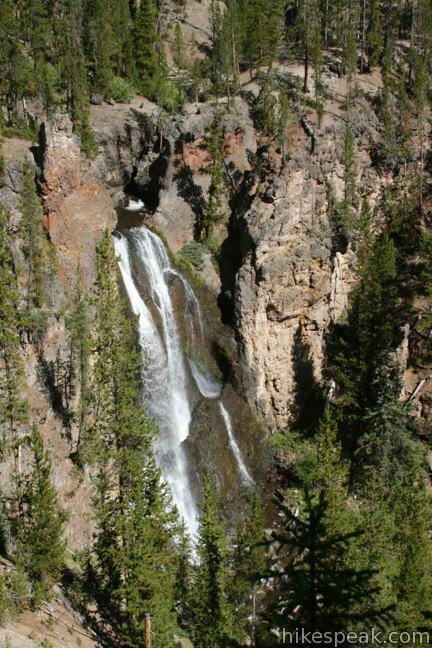 Enjoy a postcard view of Lower Falls before returning to North Rim Trail. 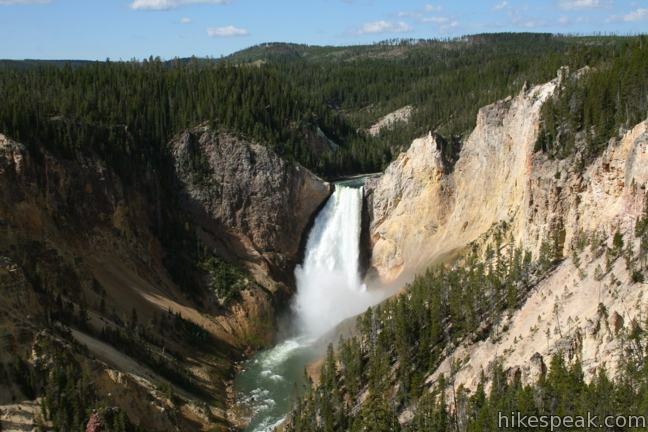 With more effort you can hike 0.75 miles round trip down to Red Rock Point for a closer look at the 308-foot tier of Yellowstone Falls. 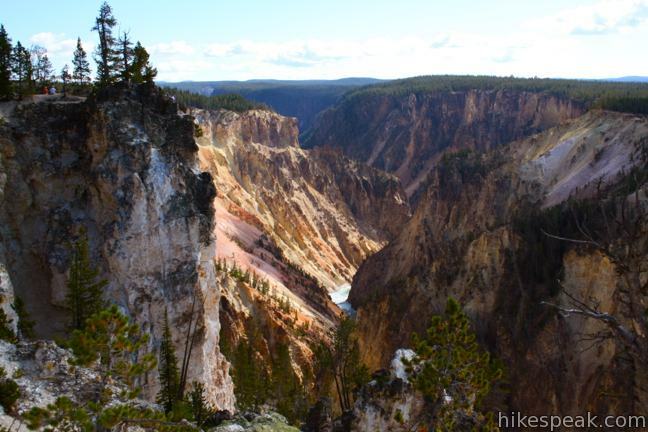 Continuing on North Rim Trail, you will pass more views of Lower Falls. 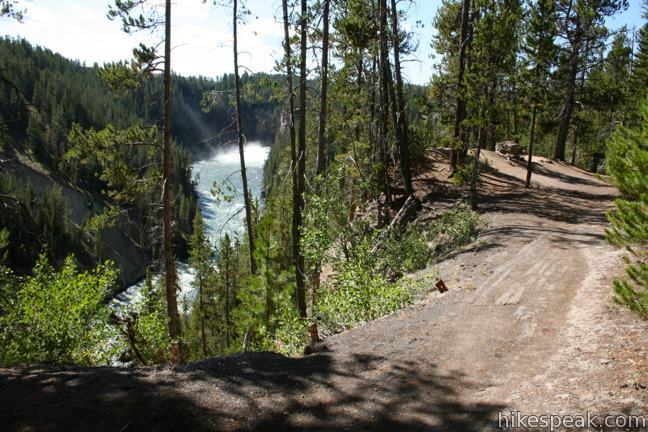 After North Rim Drive curves away from the trail, you will reach a spur heading down to the brink of Lower Falls. 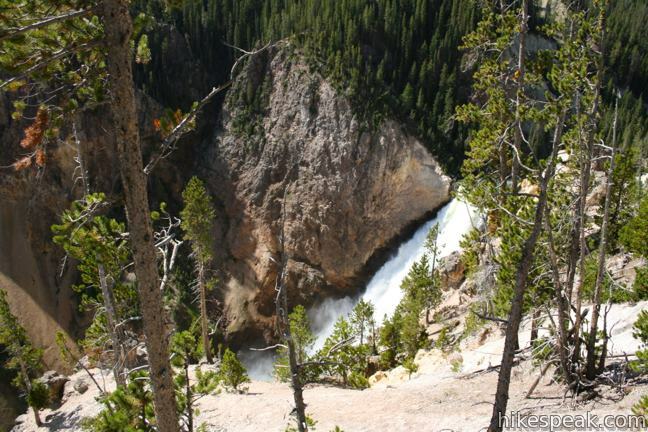 This difficult addition comes 2.5 miles from Inspiration Point and demands that hikers descend 600 feet over 3/8 of a mile to reach the Lower Falls. 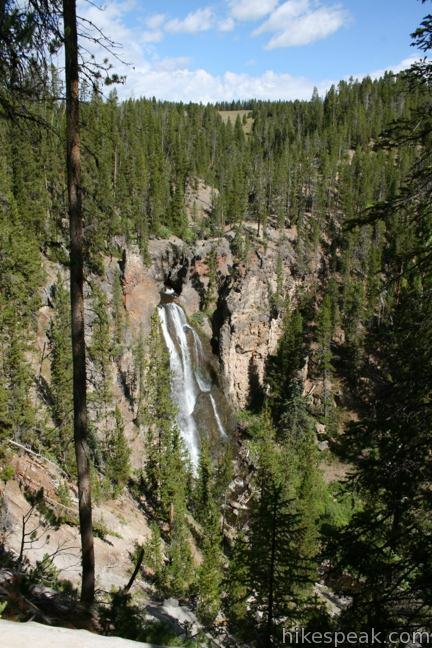 Even if you don’t have the energy for that extension, you can get a close view of another waterfall right from North Rim Trail. North Rim Trail dips across a depression in the side of the canyon caused by Cascade Creek. 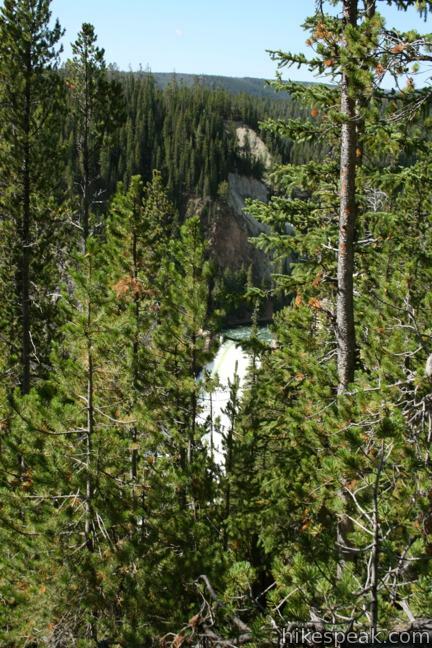 Cross the creek and head uphill to a view looking back toward Crystal Falls, a silky 130-foot drop bounding through pines toward the Yellowstone River. The trail emerges from the woods once more as you reach a parking area for the Brink of the Upper Falls Trail. 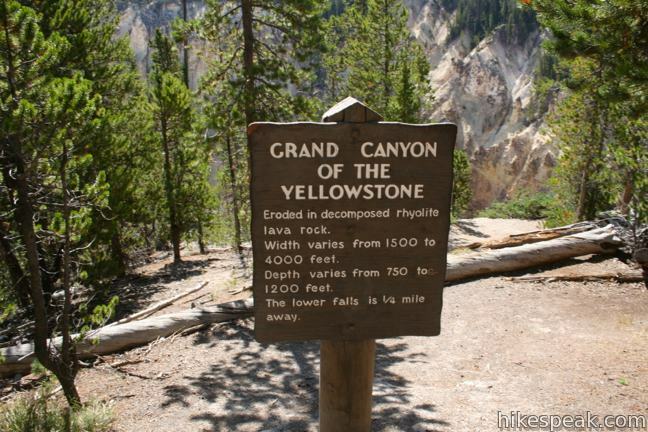 Pass the parking lot and continue on North Rim Trail, quickly reaching the mandatory turnoff to the stone viewing platform at the top of the 109-foot waterfall that sets off the Grand Canyon of the Yellowstone. 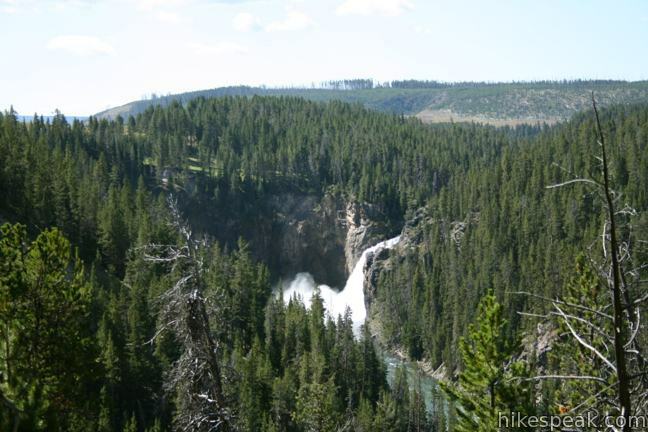 Beyond the Brink of the Upper Falls, North Rim Trail continues another 0.4 mile along the Yellowstone River up to a bridge crossing over to the south side of the canyon. If your legs are feeling strong, you can hike up South Rim Trail to breathtaking overlooks like Point Sublime and Artist Point, or make an impressive staircase descent to the base of Upper Falls on Uncle Tom’s Trail. If possible, visit the north rim in the afternoon for the best lighting on the Grand Canyon. 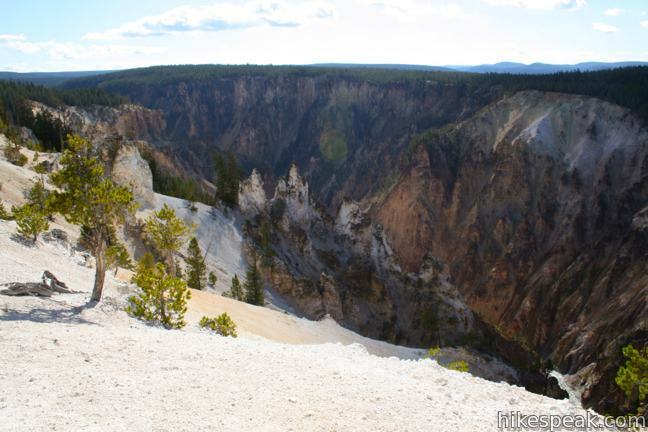 There is an entrance fee for Yellowstone National Park, but no permit is required to hike North Rim Trail, so get out and enjoy! To get to the trailhead: From Canyon Junction, where Norris Canyon Road and Grand Loop Road meet, drive east on North Rim Drive. Go 0.9 miles and turn left on a paved two-way road to Inspiration Point. After 2/3 of a mile, the road ends at a parking area for Inspiration Point and the east end of North Rim Trail. 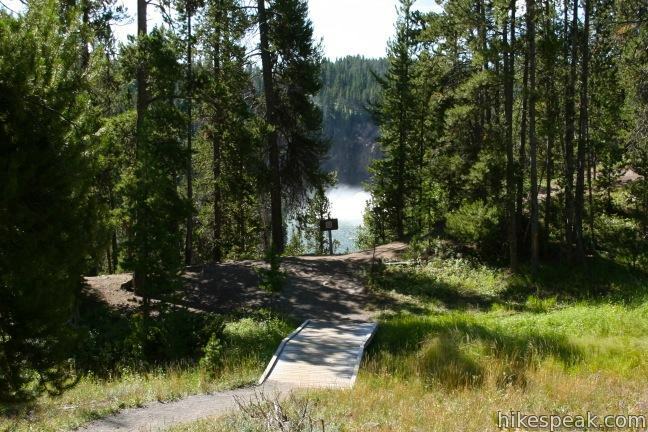 Or view a regional map of surrounding Wyoming trails and campgrounds. These photos were taken in August of 2011. Click to enlarge. Inspiration Point and North Rim Trail by hikespeak.com. 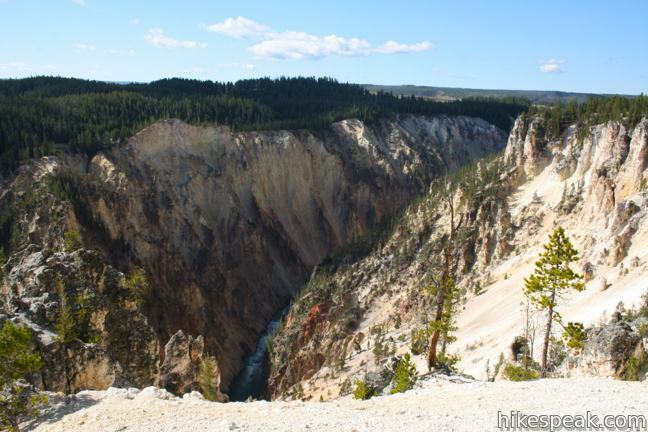 This jutting point is one of the premier vistas along the Grand Canyon of the Yellowstone River, reachable at the bottom of a flight of stairs from a parking area at the east end of North Rim Trail. 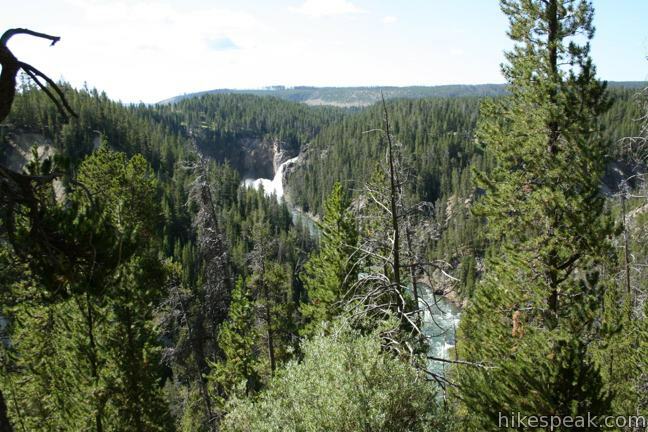 This short spur off North Rim Trail (which you can also drive right up to) achieves an impressive view of Lower Falls in the Grand Canyon of the Yellowstone River. 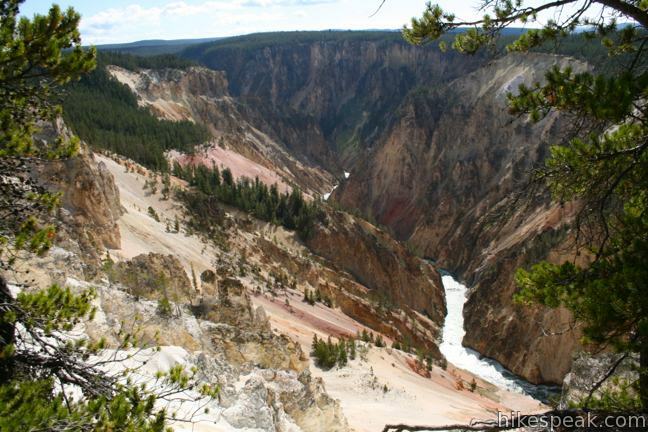 This short trail extending from North Rim Trail reaches a daunting overlook atop the 109-foot waterfall at the start of the Grand Canyon of the Yellowstone River. 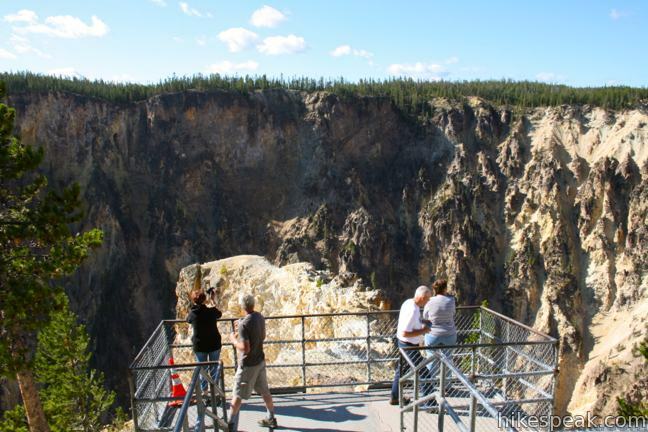 This 0.7-mile round trip hike descends a steel staircase clinging to the south wall of the canyon to a viewing platform with spectacular views of Lower Falls. 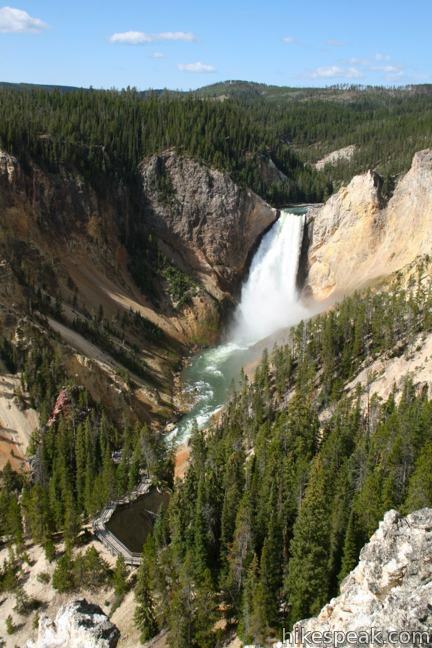 This viewpoint delivers one of the most photographed views in Yellowstone, a memorable perspective of the 308-foot Lower Falls. 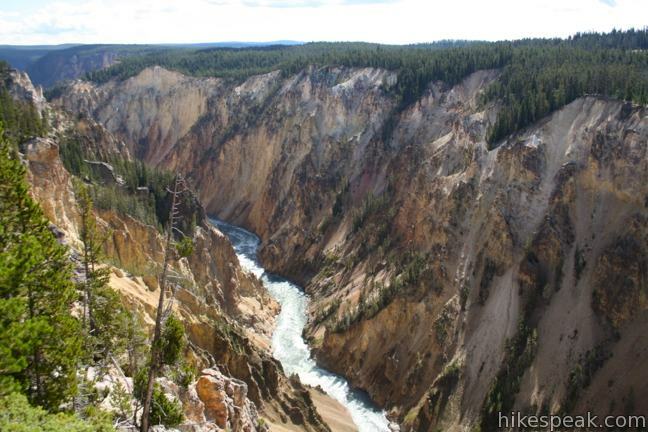 This 3-mile hike explores the south rim of the Grand Canyon of the Yellowstone River, passing Artist Point toward more excellent views. 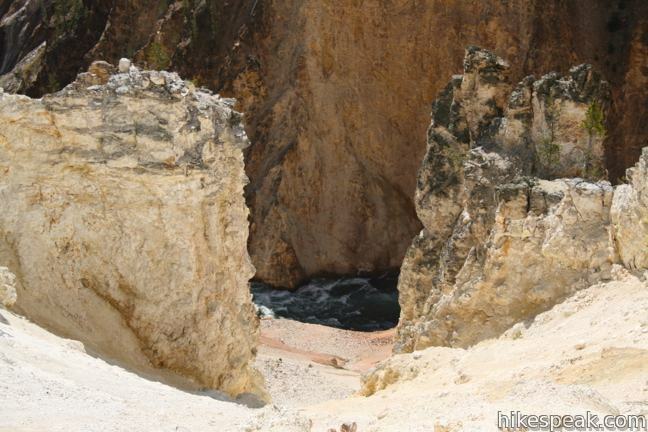 This 1-mile hike starts with a head-on view of a 132-foot waterfall. 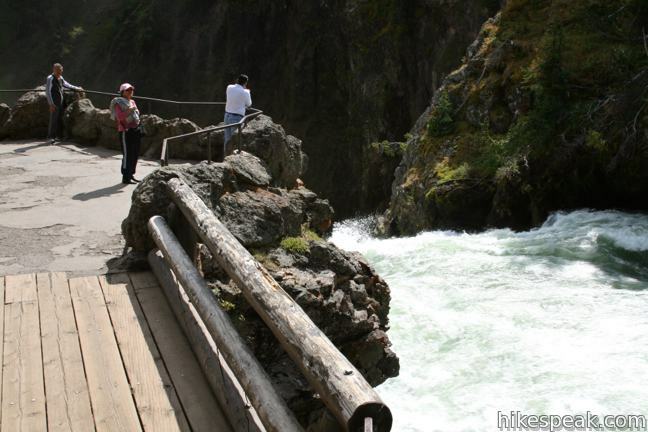 Unfortunately, the final leg of the trail to the base of Tower Fall is closed due to damage from rock and mud slides. 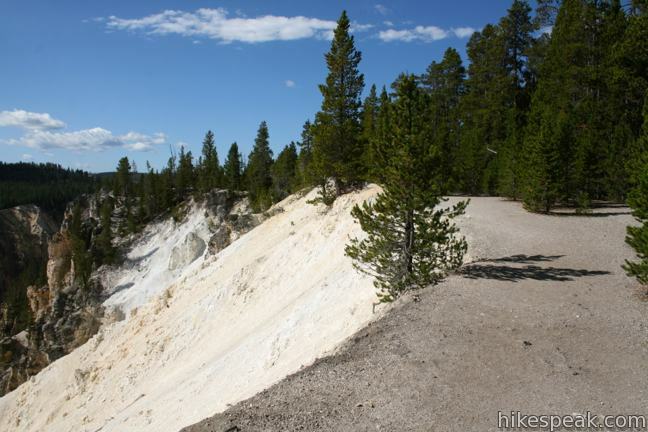 This 0.25-mile loop overlooks a dramatic section of the Yellowstone River lined by bleached cliffs and steam venting hydrothermal springs. 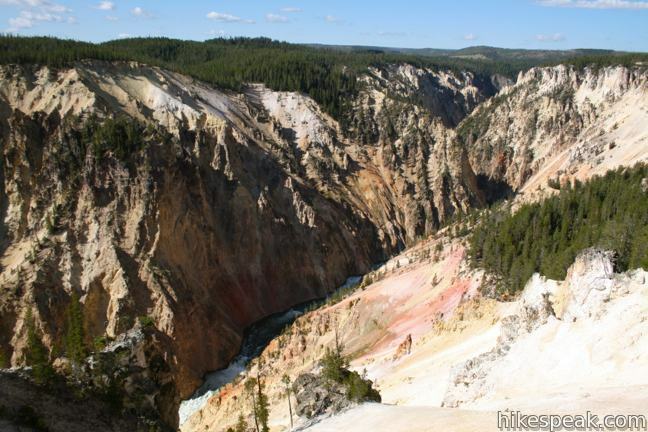 Explore other hikes to waterfalls and hydrothermal hot spots in Yellowstone National Park. 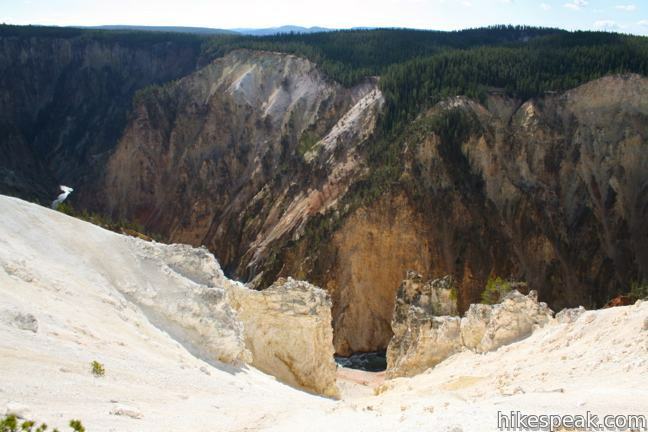 There are 12 developed campgrounds with over 2,000 total sites spread throughout Yellowstone. 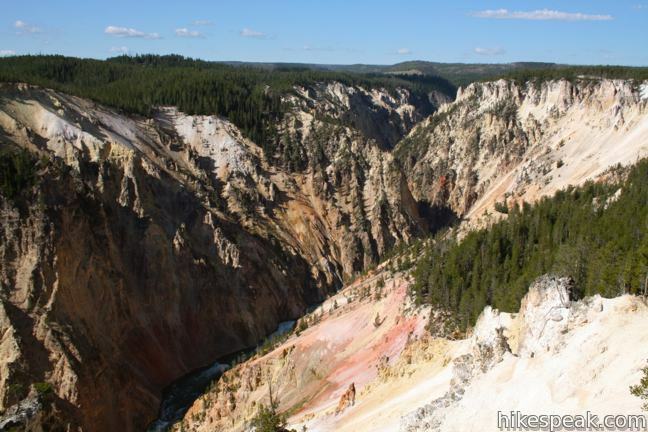 Is it possible to hike the North Rim Trail and Uncle Tom’s Trail of Yellowstone on the same day? What is the total distance? You can definitely hike both in one day. 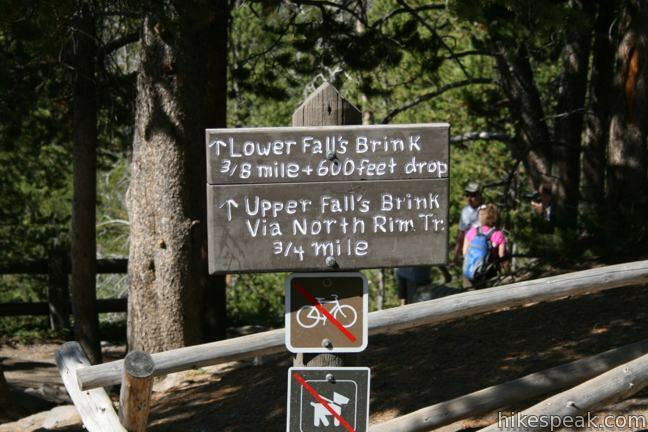 The distance will vary depending on how much of the North Rim Trail you hike and whether you connect the two trails by walking down the South Rim Trail to Uncle Tom’s Trail or by driving to that trailhead. 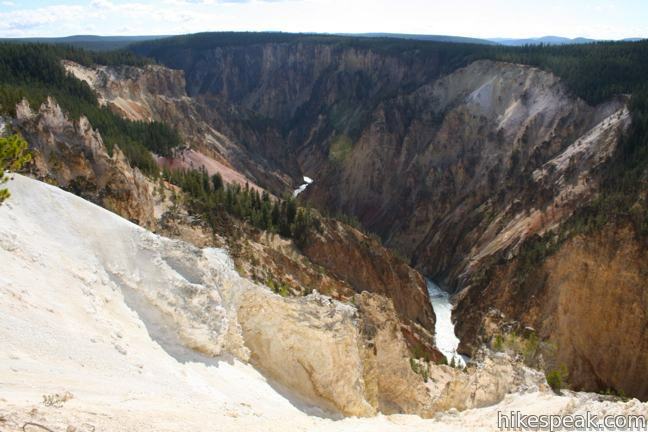 What is the best way to reach Yellowstone in last week of May? I believe some of the roads may still not be open – especially from the south. We were intending to drive up from Salt Lake City. 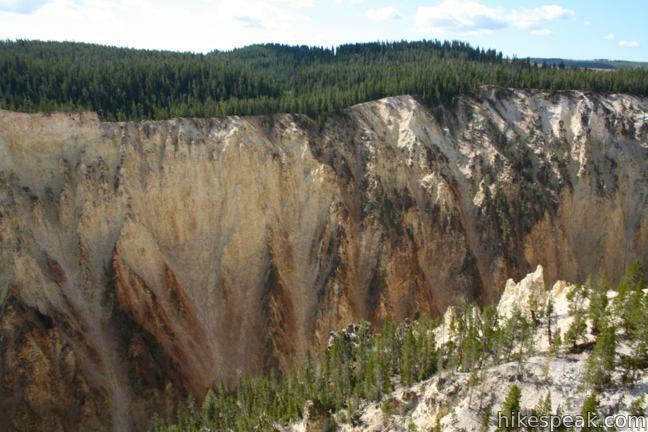 Is there a downloadable map of the Grand Canyon of Yellowstone? 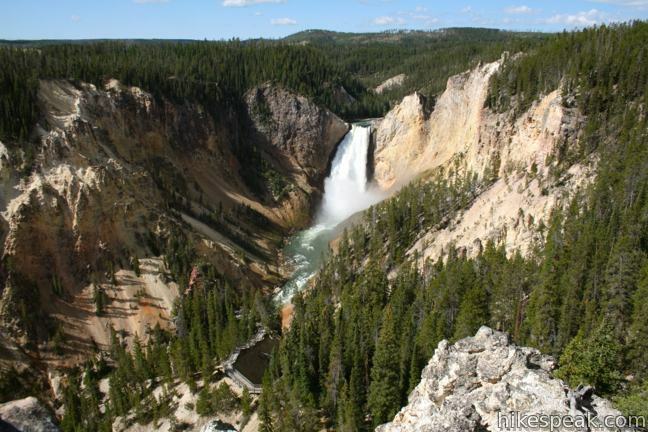 We will be there toward the end of this month for 3 days at Yellowstone (no way enough, as we’ve learned). So, we’d like to be efficient using our time. Knowing what to do ahead of time helps. Hence, we’d need a map of the area so we can cover all the major points, including (we’re told) a hike to see the Lower Falls up close. Thanks. Hi – The official park map includes a close-up of the Canyon Village Area. You’ll receive one at the part entrance. Thank you for the best overview of the trails I have found on-line. So helpful in planning 2018 trip. 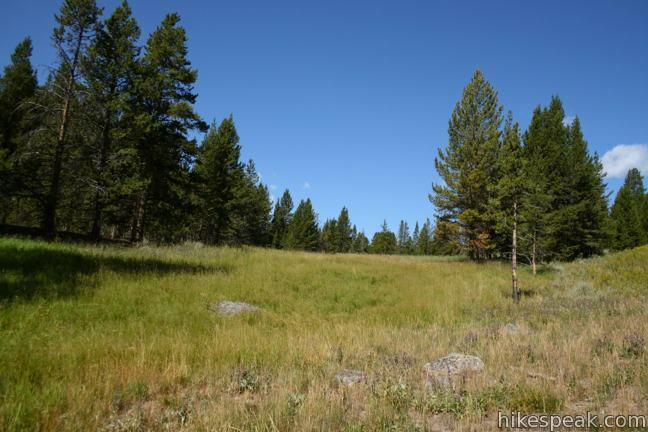 Is there a way to do a through hike without a 2nd car? 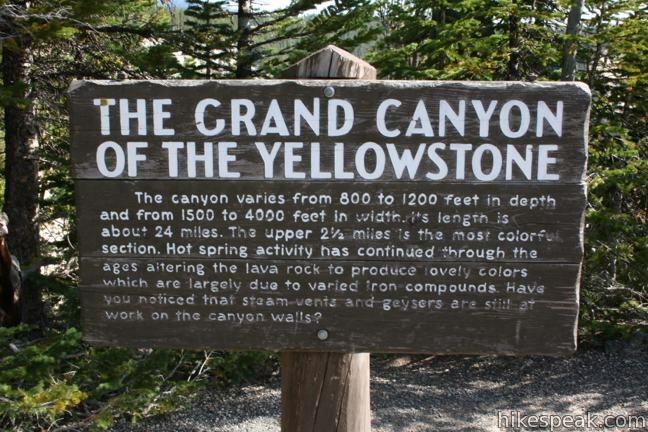 We’re staying at Canyon Lodge – is it walkable to get there and still do this whole hike in a day (with kids, youngest is 8)? Or is it walkable on the road back to get the car if we start at Inspiration Point?